HUBER+SUHNER is offering a wide range of RF coaxial cables which are developed for highest expectations. 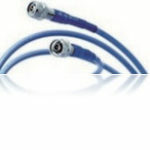 A carefully balanced range of flexible coaxial cables provide best performance where challenging requirements arise. leading supplier of radio frequency solutions. according to customer requirements. ndards and delivered with a certificate upon request.